California Deserts In 'Super Bloom' Thanks To A Wet Winter A rainy winter has brought an early spring to Anza-Borrego Desert State Park in Southern California. Wildflowers are in bloom. How can seeds survive years of drought and then put on such a display? 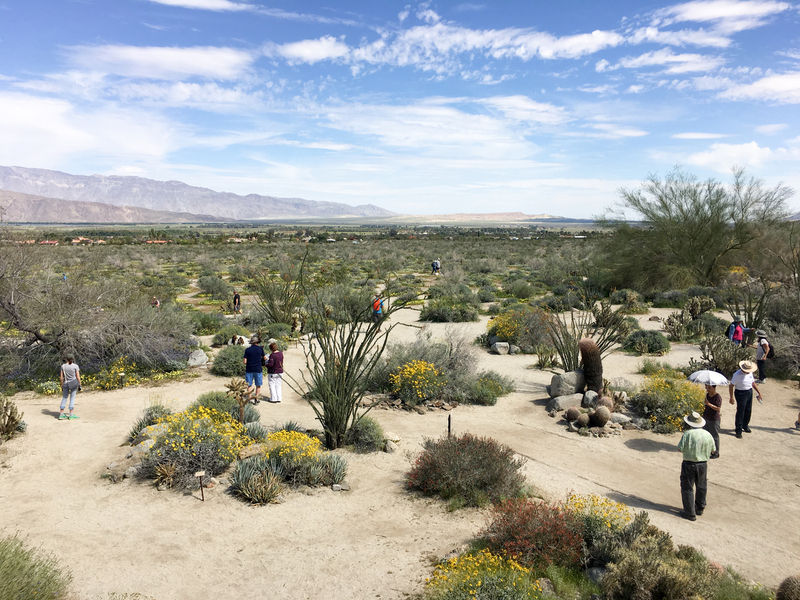 People are scattered throughout the hills and valleys of Anza-Borrego, Califonia's largest state park, taking in the beauty of a rare "super bloom" of wild flowers. 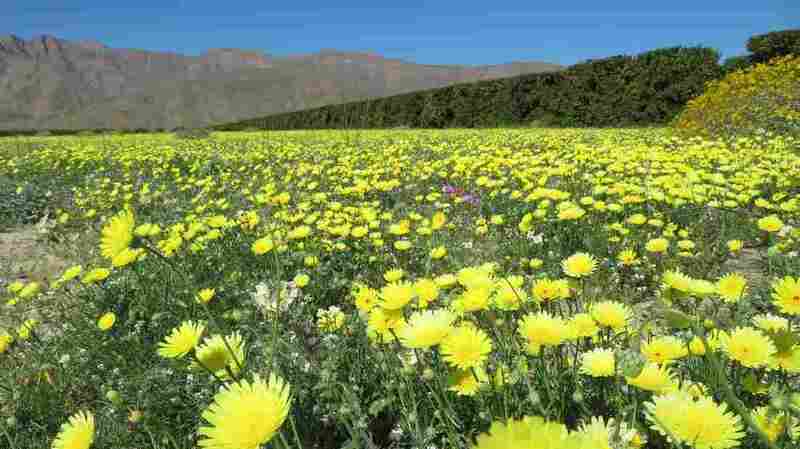 Visitors have flocked from as far as Asia and Africa to see the rare floral bloom in the California desert. "It's fantastic," says Dennis Brian, from Reno, Nev., who says he was a flower child in the 1960s. "You don't see this very often. The little flowers look so delicate, but yet they're prolific. They're everywhere." "It's neat to see so much color on something that's usually so tan and stone color with all the rocks," says Andrea Smith, who brought her 16-month-old baby here in the 90 degree heat at high noon on Wednesday. These were just a few of the many people flocking to see the colors blanketing the hills and valleys of Anza-Borrego. It is California's largest state park, in the desert south of Palm Springs, a nearly four-hour car drive from Los Angeles. Visitors are coming from as far as Europe, Africa and Asia. This super bloom is so rare, so special, that looky-loos are causing traffic jams, getting lost in the hillsides and fainting from dehydration — just to take in the beauty. California has been so unseasonably wet, its deserts are experiencing a "super bloom." After years of drought, the desert is lush. "I'm looking at a whole field of this bluish purple phacelia. And in this foreground of the Coyote Mountains, that's nothing but poppies going 5, 6 miles up-canyon," says park ranger Steve Bier. He says this is a really big deal; there are flowers in places where you usually don't see them, like in the badlands that are home to snakes and bobcats and coyotes. Park ranger Steve Bier says this year's conditions were perfect for such a phenomenon: long steady rain throughout the winter — a remarkable 6 inches in all here — that soaked into the ground. There are desert sunflowers and dune evening primrose, sand verbena, ghost flowers, monkey flowers and wild Canterbury bells. 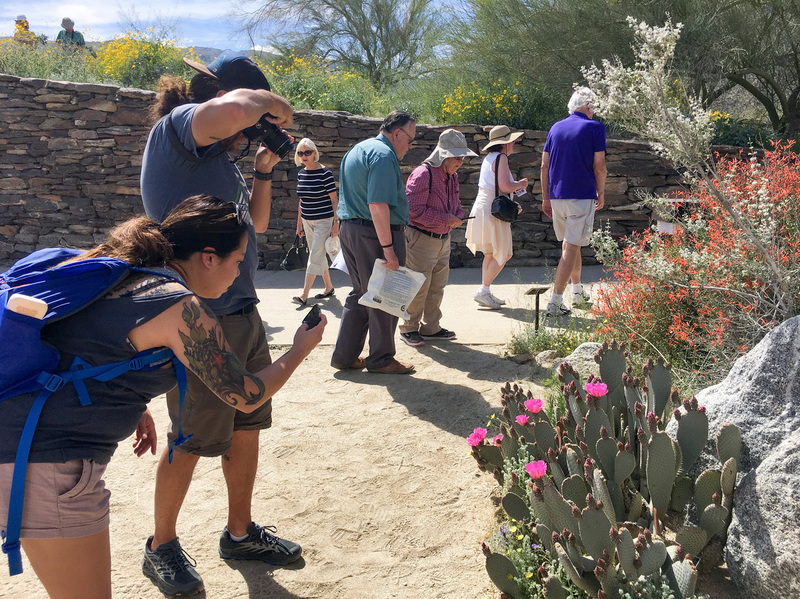 The ocotillo and beavertail cactus are beginning to bloom. Bier says this year's conditions were perfect for such a phenomenon: long steady rain throughout the winter — a remarkable 6 inches in all here — that soaked into the ground. And temperatures that were not too hot. "Some of these seeds have been underground for maybe decades, if not a century or more, we just don't know," he says. "Some of these places have not seen water in 10, 15, 20 years, and now they're a blanket of flowers." In other words, they are survivors. "You have to be tough to be out in the desert. That's for sure," Bier says. "And these are an ephemeral resource, so what you're looking at today could be gone tomorrow. It just depends on how hot we get today, and how hungry the caterpillars get." 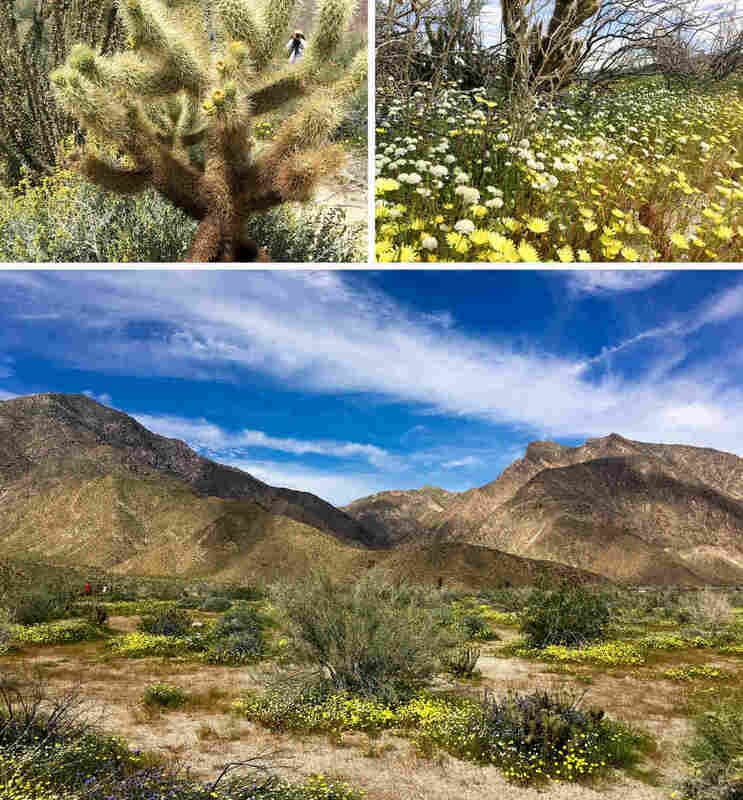 Anza-Borrego Desert State Park in Southern California is having a rare "super bloom." 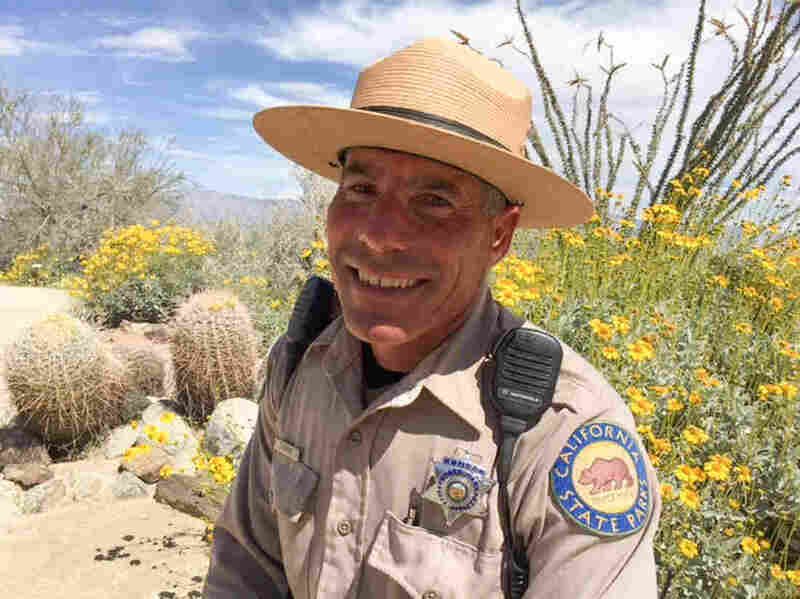 Bier says anyone who wants to see this super bloom had better get there before those sphinx moth caterpillars eat up all the flowers. Don't forget your camera, sunscreen and water.